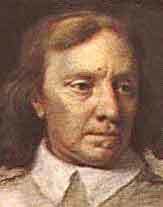 Born in Huntingdon in 1599, to a gentleman's family of modest means, Cromwell became a zealous Puritan while studying at Cambridge. He was conservative in his clothing, with a composed demeanour. When he became an MP and reached parliament, his commanding voice and fervour marked him out. He was elected to represent Cambridge City during the reign of Charles I - in the Short Parliament of April-May 1640, then in the Long Parliament lasting from August 1640 to April 1660. From the outset the Long Parliament refused to authorise any funding until Charles I - who was bankrupt - was brought to book. Soon the king was stripped of his power and parliament took control of fiscal policy and placed the army and navy under parliamentary supervision. Civil war between royalists (Cavaliers) and parliamentarians (Roundheads) broke out in 1642, following Charles's failed attempt to arrest five MPs, and this was when Cromwell came into his own. For a man with little military experience before 1642, Cromwell was to excel in the conduct of war. He moulded the Eastern Association into one of the key parliamentarian armies, and played a decisive role in a pivotal victory for parliament at Marston Moor, in 1644. An extraordinary motivator, who fundamentally believed that a soldier should be trained, well fed and paid regularly, he had risen to the rank of Lieutenant General of the New Model by 1645, when he confronted and defeated the royalist forces at Naseby, effectively ending the second civil war for Charles I. Civil war erupted once again, until Cromwell's stature was confirmed at Preston (August 1648) - when the New Model Army triumphed under his command. After the execution of Charles in 1649, he ordered the subjugation of Ireland, causing many civilians to be massacred. The remaining population was constrained by the Act of Settlement (1653). Next Cromwell invaded Scotland, and forced the nobility to submit. He also muzzled the press, and defeated Leveller rebels. Another dissolution of Parliament made way for the Barebones Parliament (or Nominated Parliament), which proved a failure. In response Cromwell established the Instrument of Government, awarding himself the office of Lord Protector, supported by a single-chamber parliament. But the high expense of his army, and the failed trade wars with the Dutch, proved disastrous. Cromwell had returned England to the same unhappy situation that had prevailed during the reign of Charles I. Despite this, his benevolent despotism was acceptable to a weary nation, and it was not until his death in September 1658 that this particular chapter in British history was closed. Even though Cromwell's son Richard was named as his successor, the Commonwealth did not eventually succeed. The monarchy was restored by 1660. Biographies of Cromwell far outnumber those of any English or British monarch. Oliver and his wife Elizabeth slept in the same apartments at Hampton Court, breaking centuries of royal tradition. Despite being a committed Puritan, Cromwell was no killjoy - he drank, danced, hunted, enjoyed music and didn't even object to horse racing or plays. Cromwell loved practical jokes. After becoming Protector he delighted in teasing the nobility by having a drum beaten suddenly during dinner, before the guests had finished their food. His footguards would then come in, with permission to grab anything eatable they could spy upon the table. In January 1661, twelve years after the execution of Charles I, Cromwell's corpse was exhumed and brought to Tyburn, the traditional site of public execution, to be hanged and decapitated.